Choose from 82 different designs depicting a multitude of animals found in or near the water; octopus, eel, tropical fish, crab, sea gull, butterfly fish, humpback whale, dolphin, sea anemone, snail, sea horse, jellyfish, penguin, osprey, sea turtle, trigger fish, walrus and many others. The patterns come in a variety of shapes and sizes. 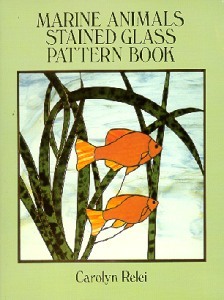 They can be easily adapted to a broad range of stained glass work. 64 pages. Click the button below to add the MARINE ANIMALS STAINED GLASS PATTERN BOOK to your wish list.